It has been seven years since the last drawing up of the former Long-Term Vision during which Hiroshima University was adopted for “A Program for Enhancing Research Universities” and “The 13 Type A (Top Type) universities under the FY2014 Top Global University Project.” With Designated National University Corporation system also starting from FY2017, an environment surrounding Hiroshima University has changed dramatically in the past. While ascertaining these ongoing changes in humble and objective manner from a higher perspective, the drafting of “New Long-Term Vision of Hiroshima University” has been undertaken and reviewed. By establishing a new philosophy of peace science “Science for Sustainable Development,” Hiroshima University will contribute to the realization of a diversified, free, and peaceful global society. Establishment of a Worldwide Research and Education Center Leading Science for Sustainable Development. 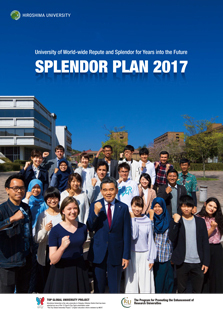 Click the image to view the brochure of the SPLENDOR PLAN 2017.